Researchers are beginning to find that placing bamboo inside of concrete could save thousands of lives in developing regions. Every couple of years a major earthquake strikes and destroys thousands of lives. The recent earthquake in Nepal comes to mind (8,000+ fatalities), as does the 2010 earthquake in Haiti (230,000+ fatalities). Most of those deaths are caused by the collapse of heavy buildings made of concrete and masonry. Concrete and masonry buildings are popular building materials in developing regions because they are cheap, readily available, and take advantage of the low cost of labor. However, these buildings often lack the reinforcement needed to withstand earthquakes. Concrete and masonry can withstand enormous amounts of compression but it doesn’t take much to pull them apart. Steel, on the other hand, can resist extraordinary amounts of force pulling it apart. For this reason, we almost always reinforce concrete structures with steel so that they can handle being both crushed AND pulled apart. When a beam is loaded with weight, it bends a little bit. The top is pushed together (compression) and the bottom is pulled apart (tension). 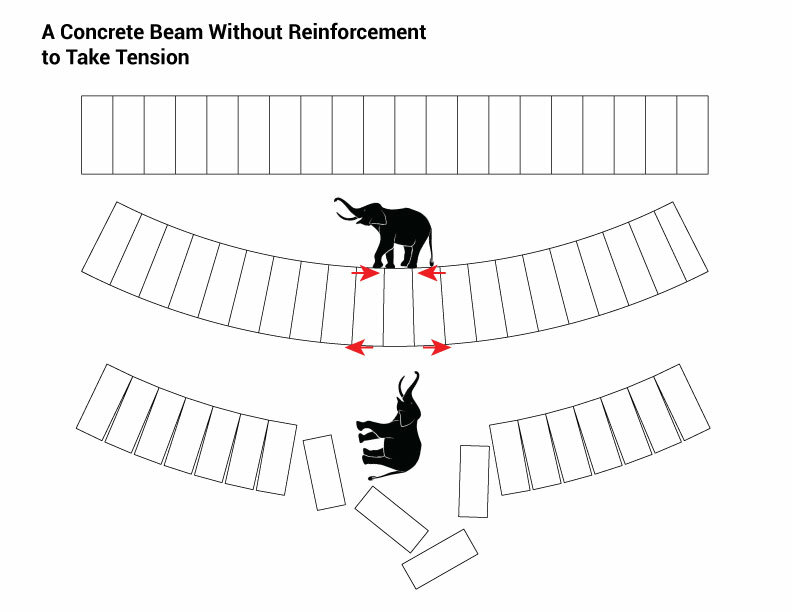 Without reinforcement, the part of the beam that’s pulled apart (in tension) will crack, crumble, and ultimately collapse. Unfortunately, in many developing areas, builders may use inadequate steel reinforcement or no reinforcement at all because it’s too expensive or too hard to get. When an earthquakes strikes, buildings without adequate reinforcement crumble and bury occupants under tons of building material. What can be done to remedy this problem? Recent research shows that bamboo may be physically similar enough to steel that it can be used as reinforcement instead. Unlike steel, bamboo grows abundantly all around the world and costs nearly nothing. This means that if a builder is forced with the choice of building a school with no reinforcement or having no school at all, he now has a third choice: reinforce the school’s structure with bamboo. Bamboo -reinforcement has special issues to consider. First of all, it expands like a sponge when wet, damaging the concrete around it. Luckily, there are a myriad of ways to waterproof it cheaply and effectively but builders must know they can’t skip this step or there might as well be no reinforcement at all. Secondly, it needs to be coated with a surface treatment that helps it stick to concrete or it will just slide around inside the structure. The biggest hurdle in the widespread application of bamboo-reinforced structures is our lack of knowledge about the way bamboo works. We can accurately predict the behavior of steel under nearly any circumstance but bamboo involves many more variables and we simply haven’t studied it enough to be able to predict its behavior with the same degree of certainty. 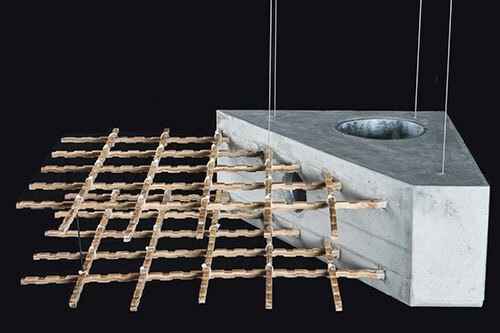 With further study, it could be a much more sustainable alternative to steel reinforcement. With a little bit of information, builders in developing regions can help prevent thousands of fatalities by reinforcing their concrete and masonry structures with bamboo instead of going without. As we continue to test bamboo-reinforced structures, we will be able to use it for more than just a last-ditch steel replacement and we can move towards more sustainable building practices.